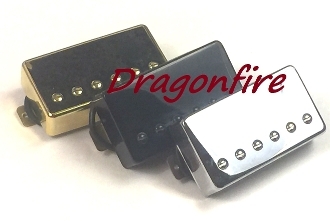 The Dragonfire A2 Bucker passive pickups are an amazing new humbucker offering for the warmth and clarity you crave with smoother magnet performance. The A2 Alnico 2 Buckers can provide you with less bite than the A5 magnet style while improving mid-range performance. Featuring a softer magnetic string pull, these A2s give you great performance without going overboard so your playing can take center stage. For everything from Blues to Classic Rock, these humbuckers are an excellent choice for Classic LP tone. These are hot wound and boast an Alnico 2 (Alnico II) magnet style along with bonus adjustability. The dynamic A2 Bucker pickup features 1 row of slug / flat top style polepieces and 1 row of regulating screw style polepieces so 6 polepieces are adjustable for adaptability. Standard color and covered pickup cover styles are also available; covered styles add about 1mm in overall size. The alnico magnets in these pickups provide warm, smooth tone for less harsh and more cream in your playing. These humbuckers are 4-wire so you can coil-split for even more versatility. In single coil mode, this humbucker performs smoothly with clarity and functionality. For high-end performance, we recommend using 500K pots and 0.047 tone caps (available separately). Choose a single humbucker bridge, a single humbucker neck or a matched HH set that is collaborative so the pickups will work in conjunction with one another for best possible performance. Measurements provided are approximations; variability is to be expected. Basic wire color codes will let you know which wires are hot and which are grounds. Due to the vast and varied nature of possible set-ups, we do not provide specific information or diagrams for installation. You should be able to use the simple information we provide to match up with any diagram or instructions you choose to use. Installation requires soldering and compatible system. We provide enough pickup lead wire to complete installation wiring in standard usage situations. Nothing else is included. Any extra images are provided for additional reference and comparison purposes only. ASK ANY QUESTIONS PRIOR TO PURCHASE. Buyers assume all risk of use; sales are only offered to those competent to safely and lawfully purchase and use items. Allow and expect variation in color due to photo and monitor settings, perception, lighting, as well as natural product variance. Ask any questions regarding options, measurements, installation requirements, special requests, etc. prior to purchase. Detailed instructions for installation are NOT included. You should be able to use basic knowledge of wiring with the diagram or instructions of your choice. Take your time for installation; do not use power tools and do not over-tighten or apply too much pressure on components. Inspect your order upon receipt. We will address any issues PRIOR to installation. If everything is in order, simply install carefully to enjoy.